“It starts with a little clamber, a little hubbub, a surprised exclamation, a growing crowd….” Announcing Ruckus! A mixed media art show featuring Kyle Buttram, Kathryn Ervin, Jenna Hernandez, Kirksey Lowther, Susan McRae, and Hannah Thrower at City Hall this spring! These artists are generously donating a percentage of their proceeds to our student studio at the Outreach Center! We are so honored to have these creatives supporting arts education in our community. Pollywogs & Wigeons is a four day camp for students ages 5-13. 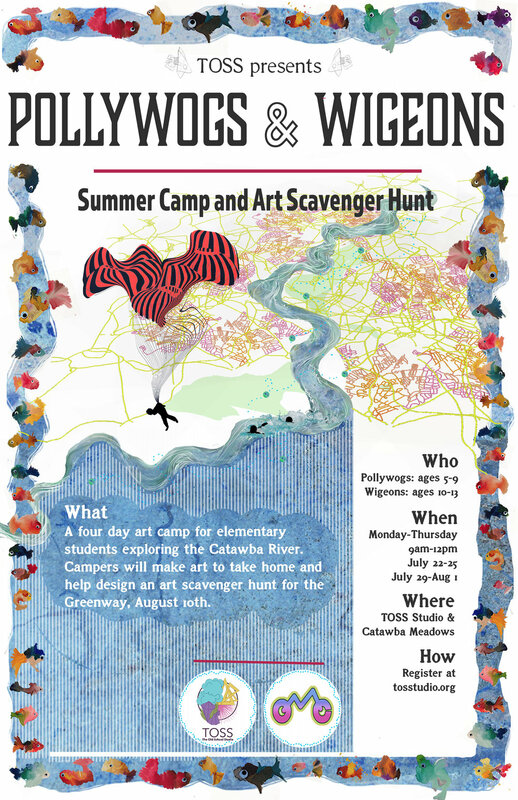 Campers will create art inspired by the Catawba River and help produce an art scavenger hunt for the community, August 10th. TOSSafter is an afterschool program for students in k-8th grade. 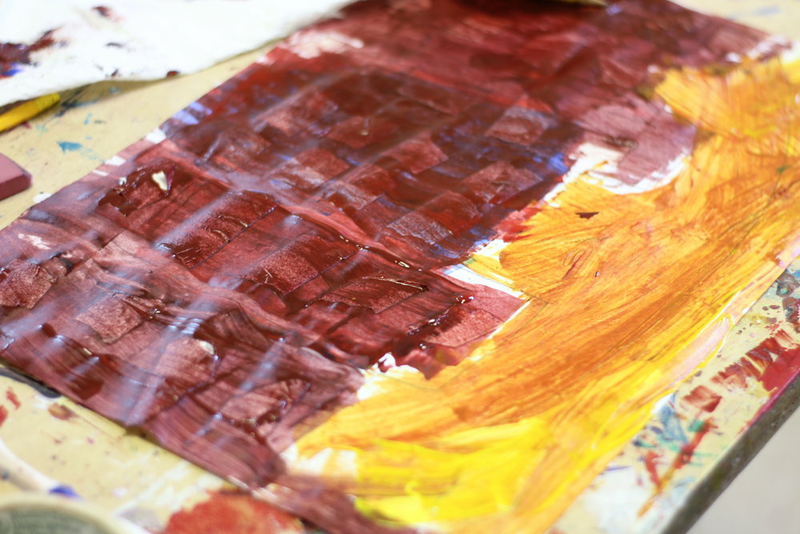 Students are trained in creative, critical thinking and familiarized with visual mediums such as painting, drawing, ceramics, sculpture, printmaking, textiles, and photography. 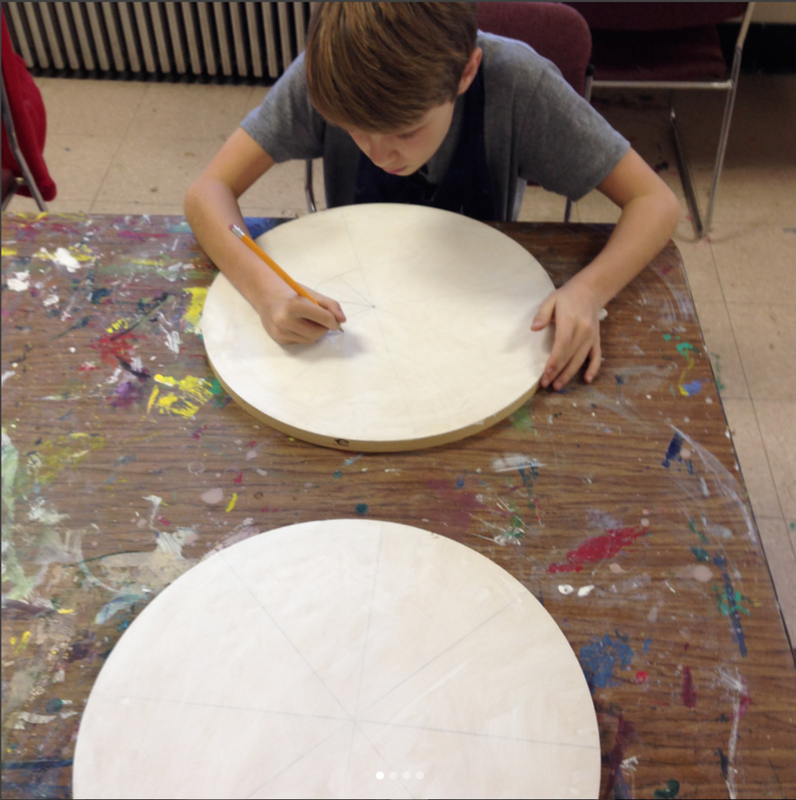 TOSSworks is a series of workshops we host with partnering organizations for students in k-8th grade to experiment with visual mediums in more depth. This spring workshop series is based on Fiber Arts. TOSStern is an internship program in which high school and college students are paired with mentors and resources to develop community art initiatives in Morganton. Interns are presented with information on current art advocacy initiatives, art historical examples, and guidance as they are encouraged to develop a project in collaboration with studio directors, other students, and our community partners. We are stoked to be working with some incredible students this summer! Ruth Anne Ervin, Elizabeth Williams, Logan Smith, Calia Kilbo, Calvin and Jay Thomason are going to be helping us with creative productions in the community. TOSSair is an artist residency program in which artists work with our community and students to present a body of work at the conclusion of their project. We are at the end of phase one for our public art initiative, Maya of Morganton. If our project is awarded through the Z. Smith Reynolds Foundation (we will hear in late May) TOSS will be supporting local Guatemalan artists, Francisco Diego and Rico Puentes, in a mural project in collaboration with community partners including Little Guatemala, Foothills Conservancy of North Carolina, Burke County Literacy Council, St. Charles Borromeo Catholic Church, Western NC Workers Center, Burke County Public Library, Fonta Flora Brewery. A huge thanks to all our partners and community liaisons in this initiative. A full summary of our community engagement can be found on the TOSSair page. As we seek to promote emerging artists in the rural South, TOSS is sponsoring a project with the Workers Legacy Foundation to tell the story of mill workers in Western North Carolina. We are working with North Carolinian artists Jesse Barber and Zach Pomeroy on this initiative. Originally from Sawmills, NC, Barber is passionate about using photography to bridge gaps, awaken new perspectives, and expand our understanding of community. Based in Greenville, NC, Pomeroy seeks to capture fragile, authentic moments in the human experience through videography and film. Below are some images from Barber’s exploratory trip to Guatemala in anticipation of our forthcoming documentary for Maya of Morganton. TOSS has enjoyed coming alongside Elsewhere Museum’s Southern Constellations Resident, Ash Smith this spring. Southern Constellations (SoCo) is an annual, curated, program that explores experimental practices across a network of Southern artists and organizations. Every year SoCo offers a suite of programs that extend conversations across the state and region, including Fellowships, Convergences + Exhibitions, and Rural Residencies in underserved Tier 1 + 2 counties across North Carolina, which includes Burke County. Smith is currently completing a Rural residency in Morganton in the arena of performance, installation, and speculative design research. We are so grateful for the all who have come alongside TOSS this spring as we have built our community art initiative. We are so grateful for your investment in this community and for your faith in us. During the 1990’s, the Hispanic population in Burke County grew 824 percent. * Compared to the national increase of 60 percent, it is apparent that the cultural landscape of Burke County was profoundly and uniquely shifted. Most of this Hispanic population consists of Mayan Guatemalans who arrived as both war and economic refugees. While the social landscape has changed dramatically, the social conscience has largely remained stagnant. The goal of this initiative is to develop an empathetic space for community integration where the contributions of the Mayan Guatemalans to our community can be understood, promoted and enhanced. TOSS has the privilege of partnering with the Foothills Conservancy of North Carolina and other community partners including Little Guatemala, the Burke County Literacy Council, St. Charles Borromeo Catholic Church and others to engage in a public art initiative, celebrating Guatemalan culture in Morganton! 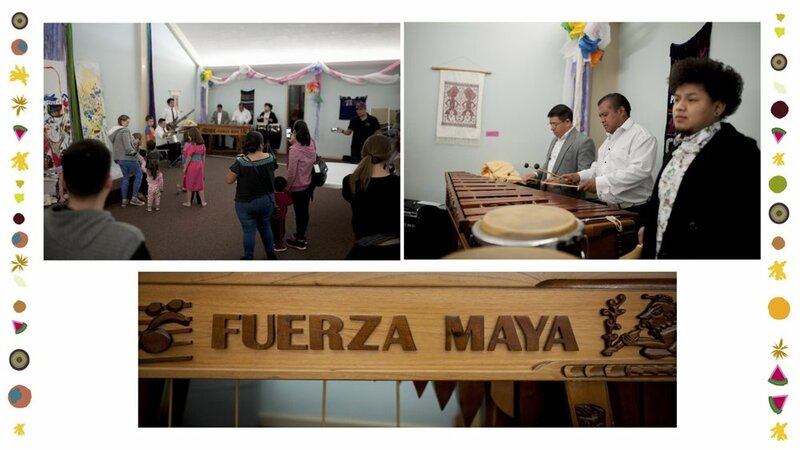 With an initial planning grant from the Z. Smith Reynolds Foundation, we will be hosting a series of dinners to gain insight from the Guatemalan community and receive feedback on a design for a mural and garden plot located at Little Guatemala, a new community center on E. Union to open in 2019 as renovations are complete. These dinners are open to the public and we welcome anyone to attend. To RSVP, or to learn more, email kathryn@tosstudio.org. 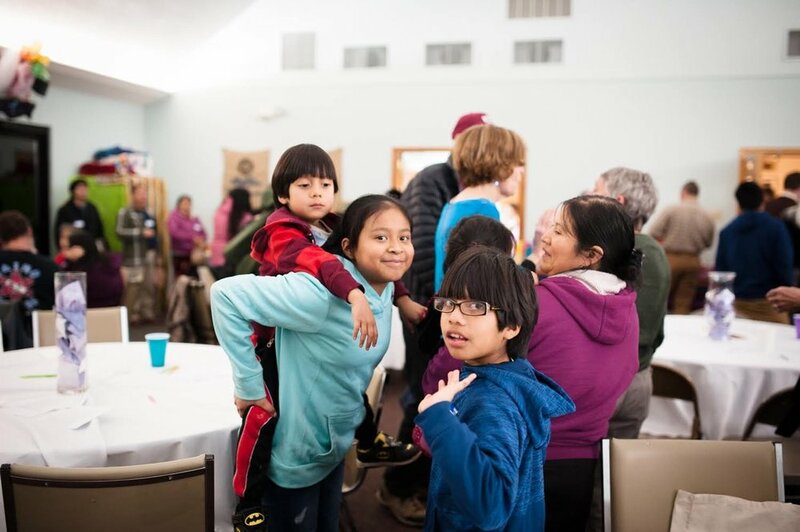 *Leon Fink in his book, The Maya of Morganton, notes that state Hispanic leaders, believe that the census undercount at least one-third of the actual resident population. Raleigh News and Observer, March 30, 2001; Morganton News-Herald, March 38, 2001. 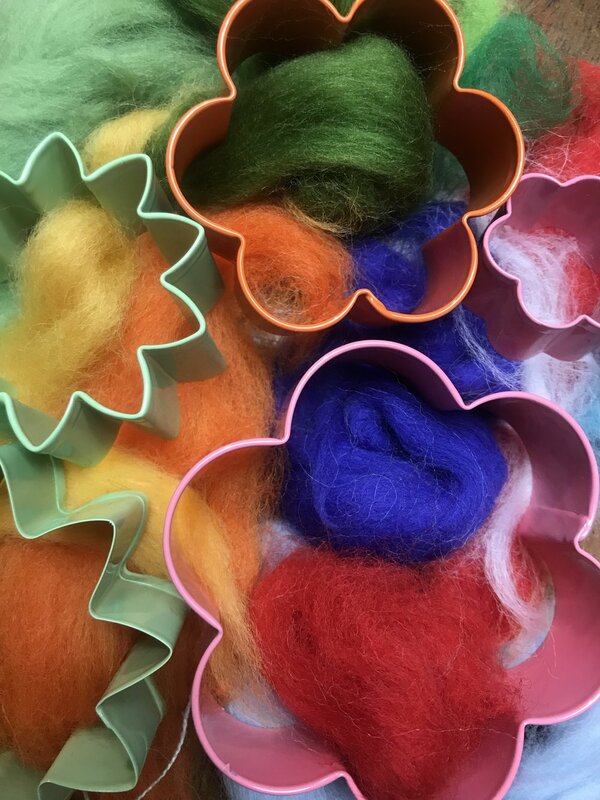 Registration for Fiber, our Spring workshop series is now open! Get more info here. 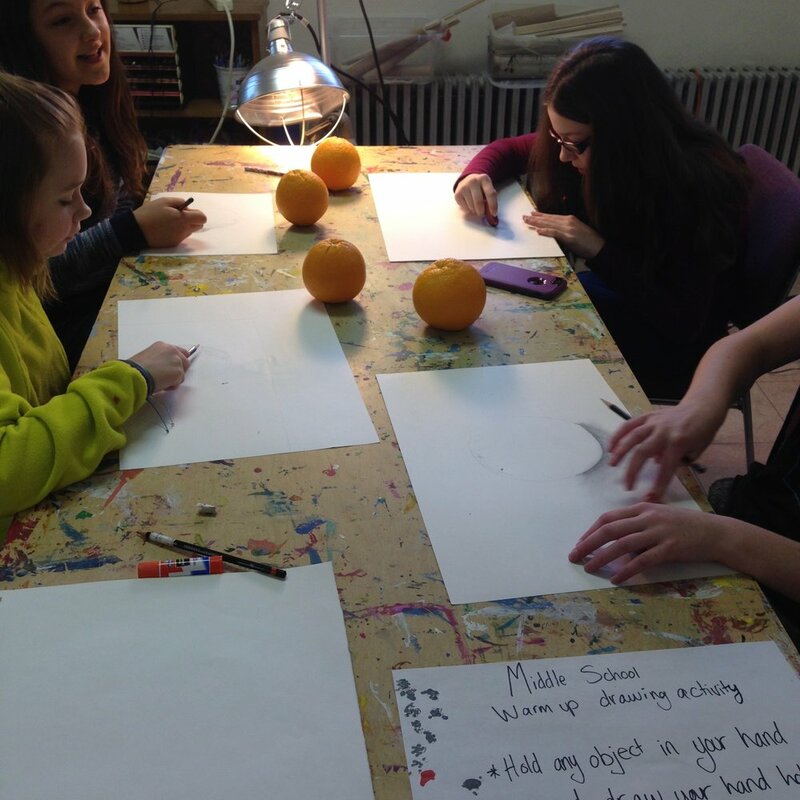 TOSSworks is a series of workshops we host with partnering organizations for students in k-8th grade to experiment with visual mediums in more depth. The workshops are designed around a central theme, corresponding to relevant issues in our community. We had a great time at Fonta Flora in November, celebrating the conclusion of our last series, Fall for the Forest. Thanks for coming out folks! TOSSair is a complimentary program of TOSSworks/after. 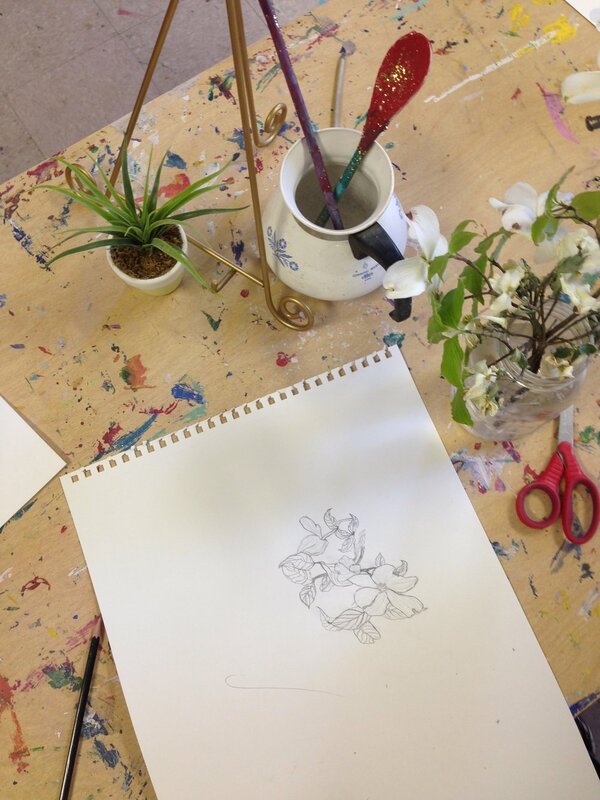 Teaching-artists participate in a residency in which they work with students, make art, and donate a percentage of their proceeds to the TOSSafter scholarship fund. Kathryn attended the Arts Education Symposium at the invitation of the Burke Arts Council, hosted by the North Carolina Arts Council, worked on several commissions, finished her school term, and has been doing heaps of strategic planning for TOSS! Hannah has been working on various ceramic commissions as well as enjoying the new member of the fam this holiday season! Kirksey has made everyone in Morganton SO HAPPY by sharing her weavings and paintings in artisan markets throughout the holiday season. 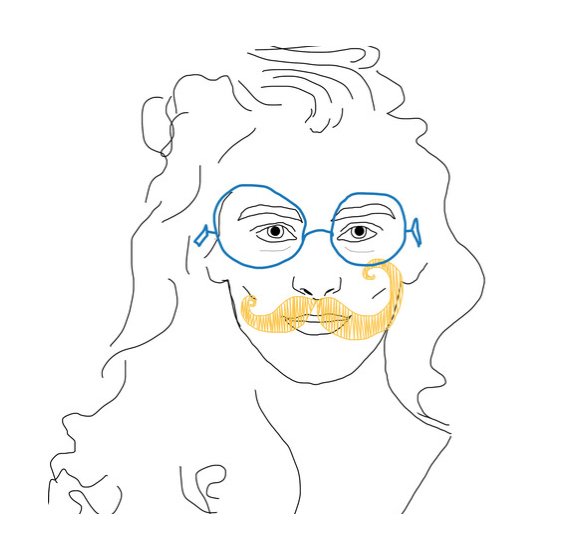 You rad, lady! 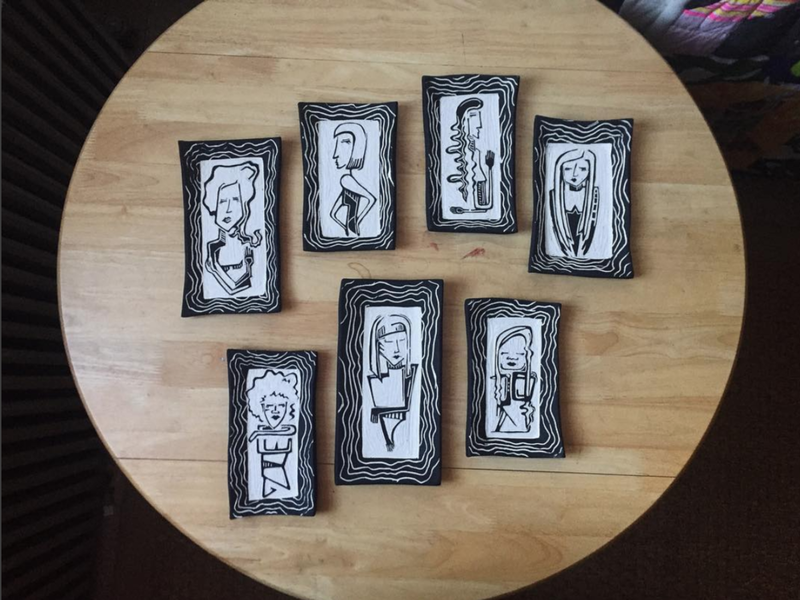 Join us for this art reception AND participate in some art making yourself! Workshop tickets are $15 at the door or preorder at www.tosstudio.org. All ages are welcome to participate! All proceeds will benefit the scholarship fund for TOSSafter, our after-school program for kid. 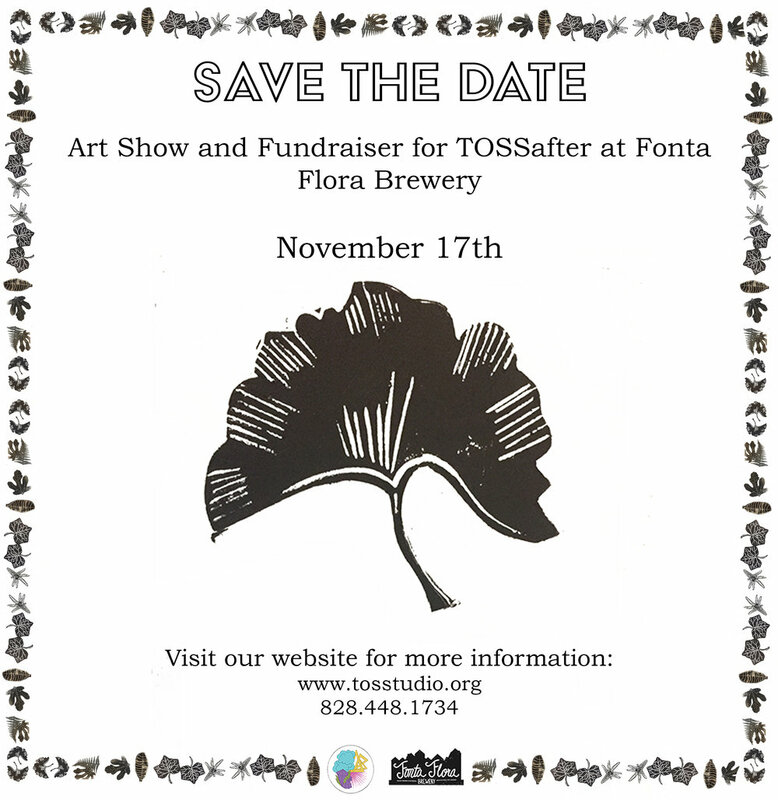 Fonta Flora Brewery will be donating a percentage of their pint sales toward a scholarship. 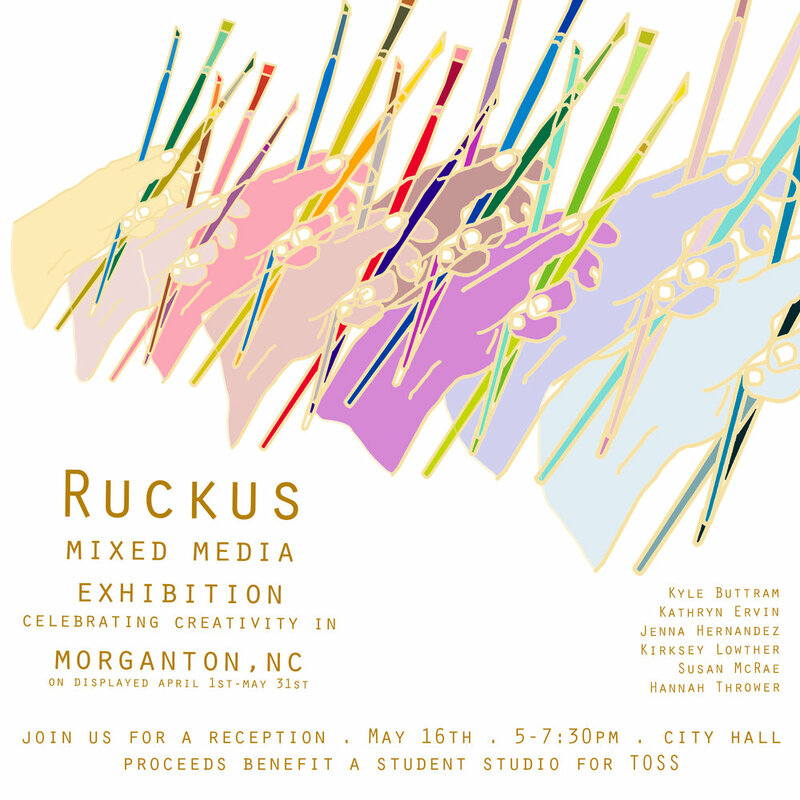 Come help us celebrate creative culture making in Morganton! 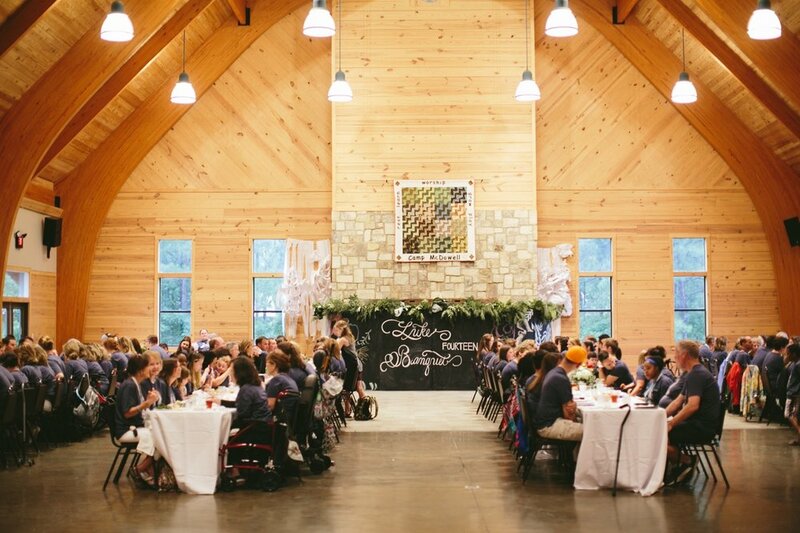 This reception concludes our Fall workshop series, Fall for the Forest. 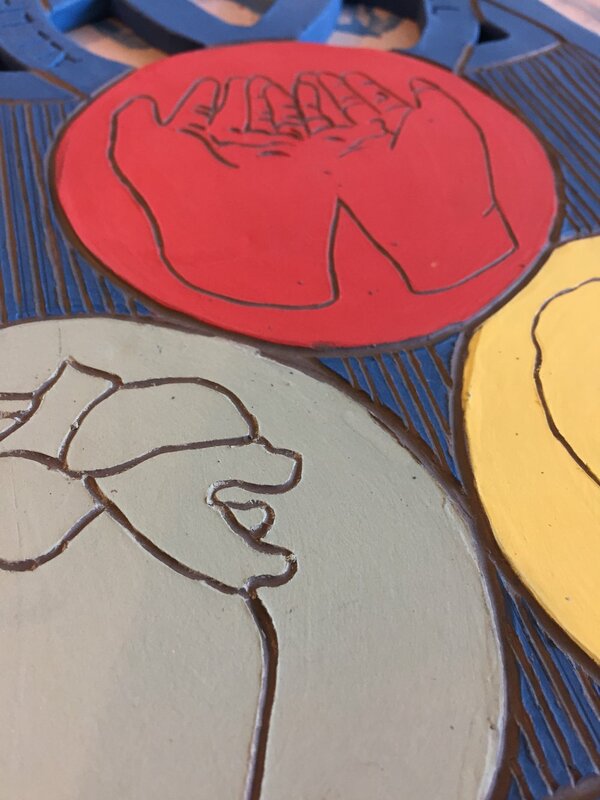 We will be celebrating the works of our intern Jordan Winiski and students who participated in our painting, ceramic, and printmaking workshops at Grace Episcopal Church. 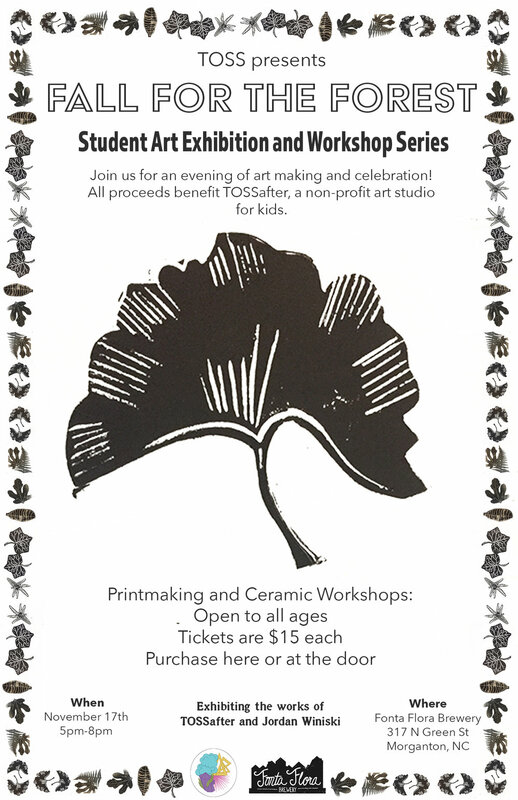 We will be using ceramic and printmaking media to make some ornaments for the holiday season inspired by this Fall series of art and ecology. TOSSworks is an ongoing series of workshops we host with partnering organizations for students in k-12th grade. TOSSafter is still in incubation as we sort out the remaining details of renovating a studio space with The Outreach Center! We will keep you posted with more deets as we go along! We have successfully completely our fall workshop series and are getting geared up for a show at FF! All the deets above. TOSSair is a complimentary program to TOSSafter. 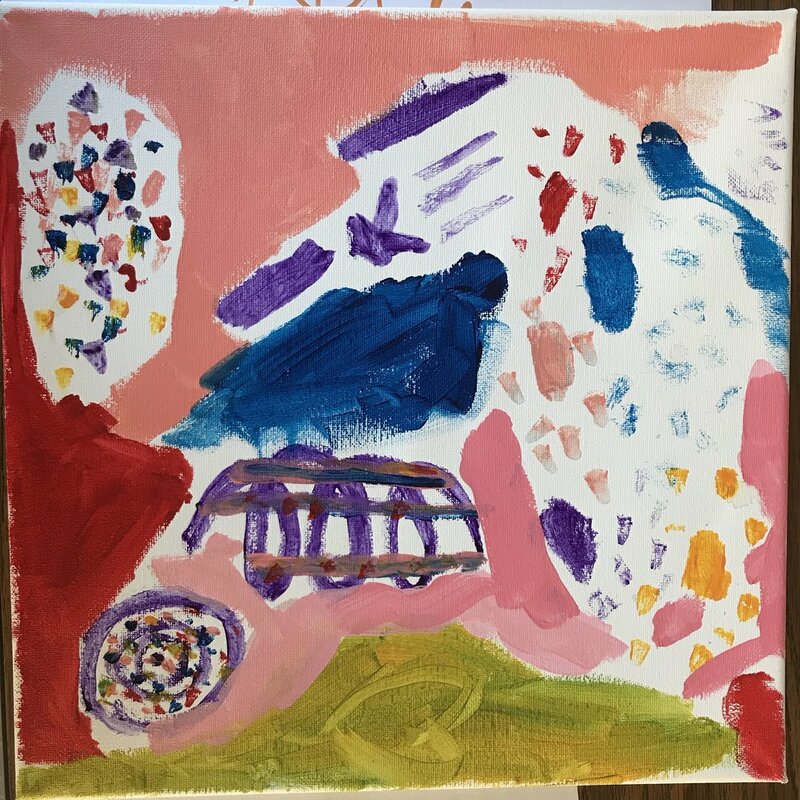 Teaching-artists participate in a residency in which they work with students, make art, and donate a percentage of their proceeds to the TOSSafter scholarship fund. Hannah brought baby Margot into the world! YAYA!! We are excited to get to know lil’ Margot and so so proud of Hannah! Congratulations to this beautiful family! Kirksey has been weaving and painting, in preparation for the Yuletide market at Fonta Flora on December 16th, 12-7pm. Come check out all the art for sale and support local makers! TOSSers are the invaluable support system which keep us afloat, off the ledge, out of the tree or under the bridge. Pardon our French, but what the heck! We need you! In this section we list some ways y’all can get in involved and say thanks for the help you have already lent. Kathryn needed two whole pages in the Treasure(ish) Hunt program to thank all those who made that event possible. We want to say a special thanks here to those who helped on the East Coast! Thank you, thank you, thank you: Robbin Ervin, Ann Bergeli, Wanda Huestess, Cheryl Black, Julie Doster, Jan Stephanides, Chloe King, Calia Kilbo, Leah Ervin, Lydia Kuehnert, Cindy Kuehnert, Kirksey Lowther, Emily Erwin, Christy Truitt, Tracey Scott, and Melinda Davis. AND….Thanks in advance to SAMUEL KUEHNERT who will be doing his Eagle Scout project with us this upcoming year. WE ARE STOKED. That doesn’t even capture our excitement actually, but you’ll just have to use your imagination. After many meetings over the summer (and a few tears let's be real) the TOSS team (Kirksey, Kathryn, and Hannah) were provided with an avenue to continue the work we care so deeply about. As a little recap, our normal programing was interrupted this summer as our studio in the old junior high building was unexpectedly reallocated by the school system. Over the summer, we moved our supplies, equipment, and furniture to a temporary studio, still having no idea where or when we would resume programing (insert tears). That was until Todd Greene, Director of Development at the Outreach Center, started a conversation with us about his work to elevate arts and culture in our community. The Outreach Center serves approximately 1,200 families weekly through food distribution, education, job training, and spiritual support. Our partnership will enable us to join in this work and fulfill our objective of advancing health and wellbeing through the arts. We will be able to relaunch TOSSafter Spring 2019, as the studio renovations are completed! Until our programing resumes, we are partnering with Grace Episcopal Church to hold a series of workshops, Fall for the Forest. Registration is still open for this series! Check it out. Y’all, we are way behind on the recap game. Here are the basics. 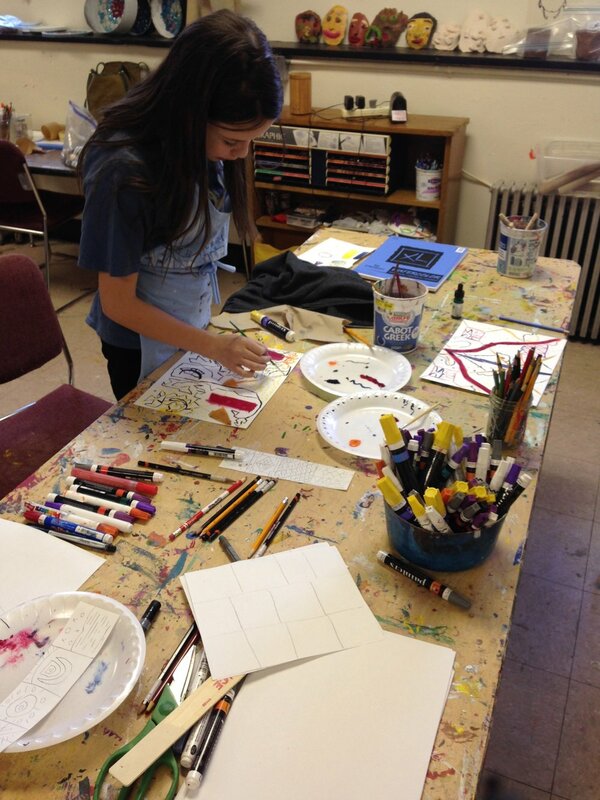 TOSSafter is an art studio for k-12th grade students. 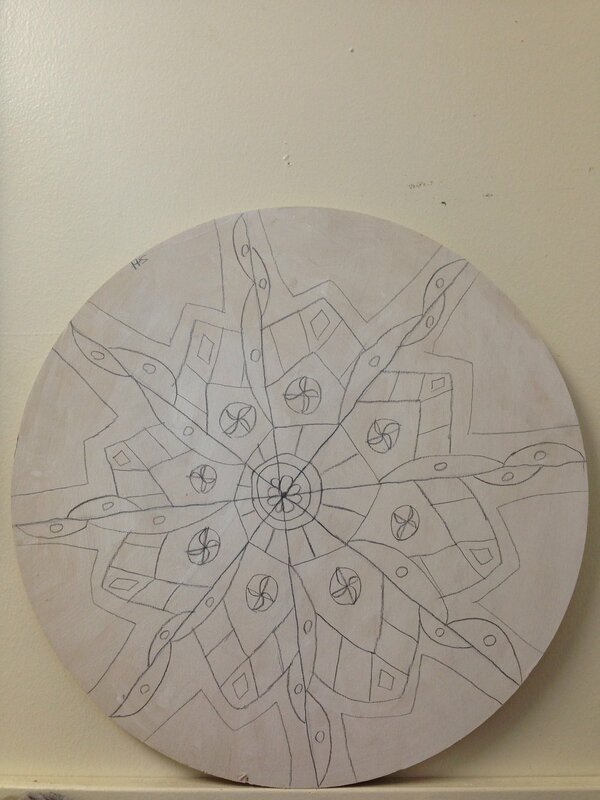 It is modeled on Room 13 and the Reggio Emilia teaching philosophies which elevate kinesthetic, collaborative learning. Through building creative capital and harnessing the power of creativity, we can develop a healthier community and a more empathetic world. TOSSafter successfully completed its first mural for WNC Real Estate! A huge thanks to Lance Turner, muralist extraordinaire for helping us pull off this project. A big congratulations to the middle school class that helped design Our Town, a mural about finding our home in Morganton. Jordan Winiski successfully completed her summer internship, sponsored by Furman University. Along with advancing several areas of research, she volunteered with the Burke Arts Council summer camp program, designing an entire week of summer classes. 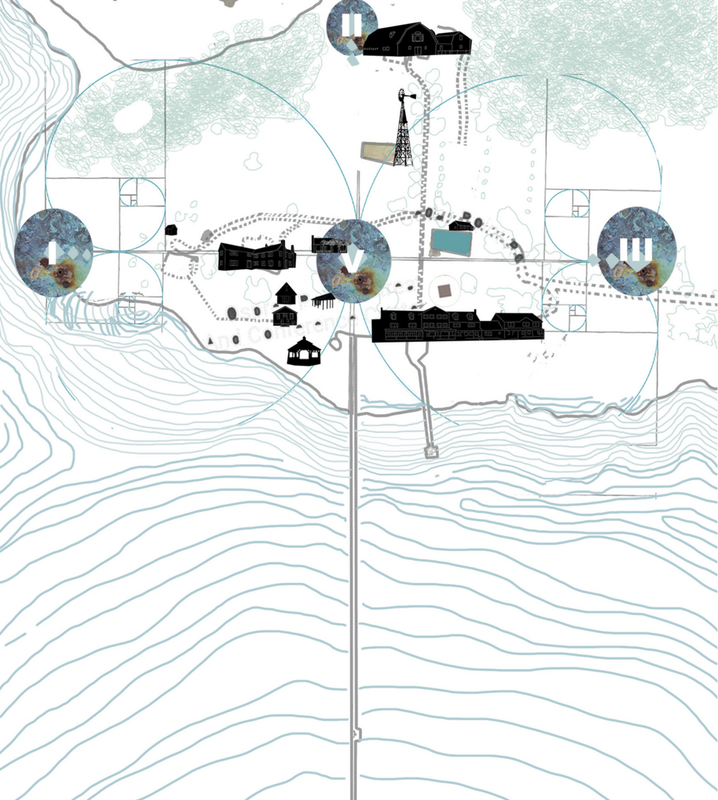 The capstone of her internship was an independent project she completed around art and ecology. We will be hosting an exhibition of her work in November at Fonta Flora Brewery. 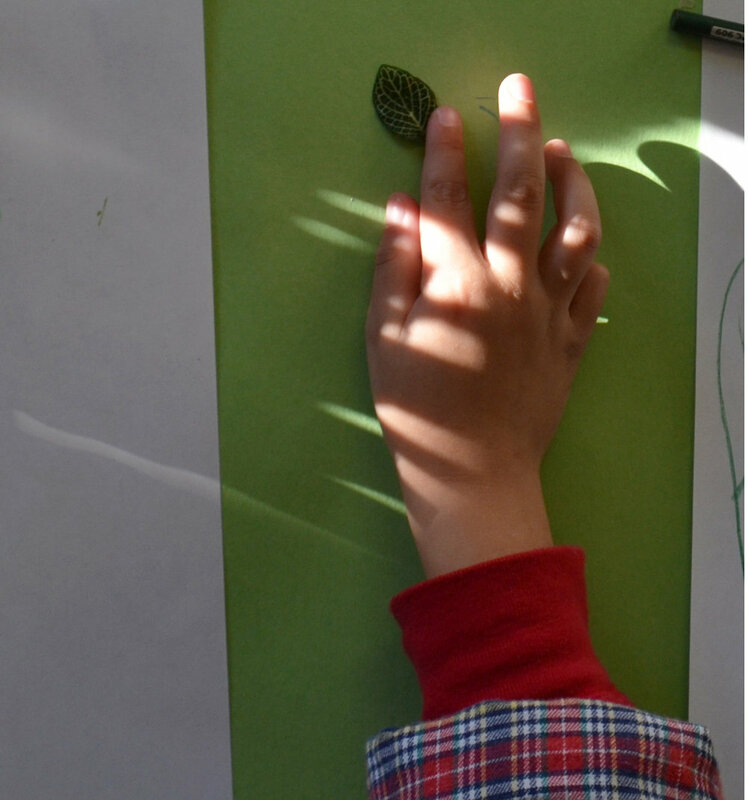 Our student programing this term consists of our fall workshop series, Fall for the Forest. More details and registration info can be found here. 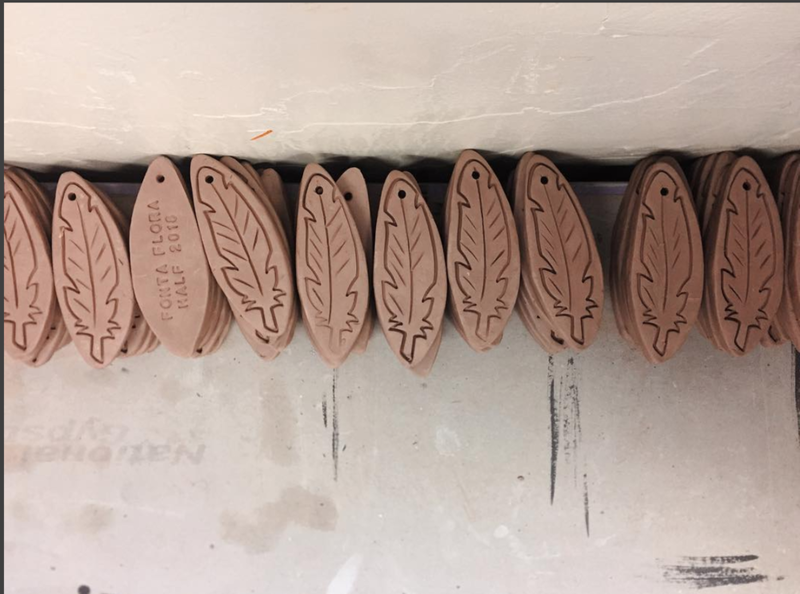 Hannah continues her work developing unique, ceramic awards for organizations, notably, Tanawha Adventures and the Trinity Fellows Academy. 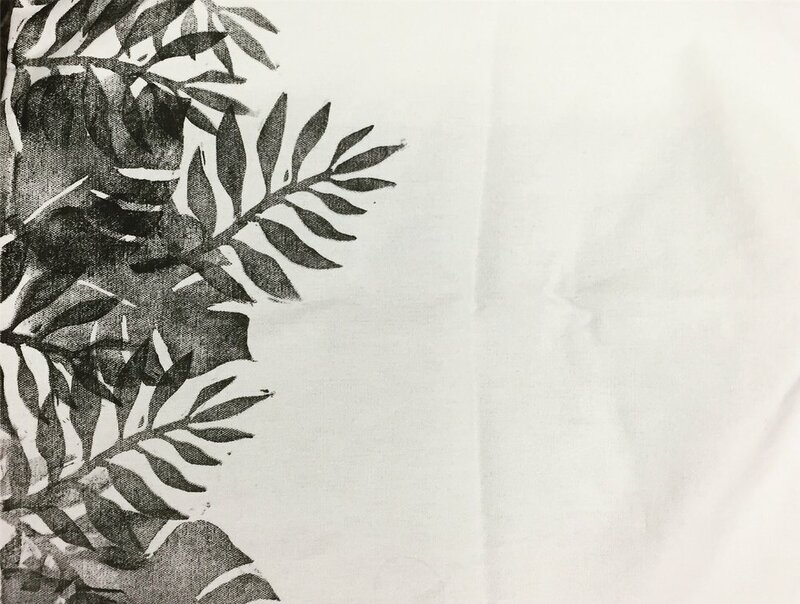 Kathryn has been working on collaborations with Hope Heals, Fonta Flora Brewery, Capita Social and most recently, Saddleback Visual Arts which will be hosting her art scavenger event, the Treasure(ish) Hunt this October! 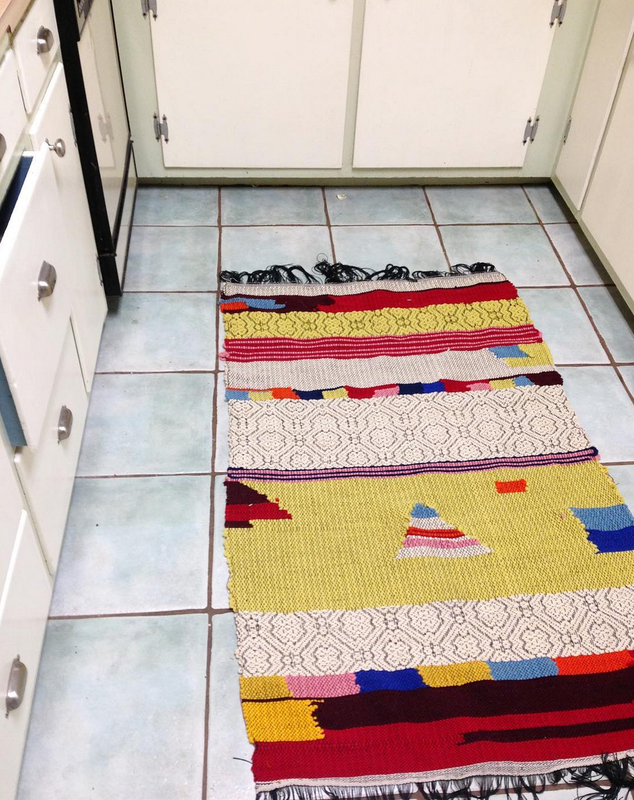 Kirksey takes on a mountain of weaving and painting projects, exploring natural fiber dyes and watercolor techniques. Check out her Etsy account for the prints she has available! TOSSers are the invaluable support system which keep us afloat, off the ledge, out of the tree or under the bridge. Pardon our French, but what the heck! We need you! In this section we list some ways y’all can get in involved. We are so honored by your support of this venture as we gear up to resume TOSSafter this spring. Consider ways you might be an active part of this organization. Wether it is volunteering, donating materials, or giving to our scholarship fund, we would be thrilled to journey down this road with you. Get started by perusing our engagement opportunities on our website. Our Spring term has come to an end and we just want to send LOTS of love to all our students. You guys keep us coming back. And......we moved! After very SLOWLY announcing this transition, it is now behind us! TOSS has relocated to 222 W Union Street for the summer. 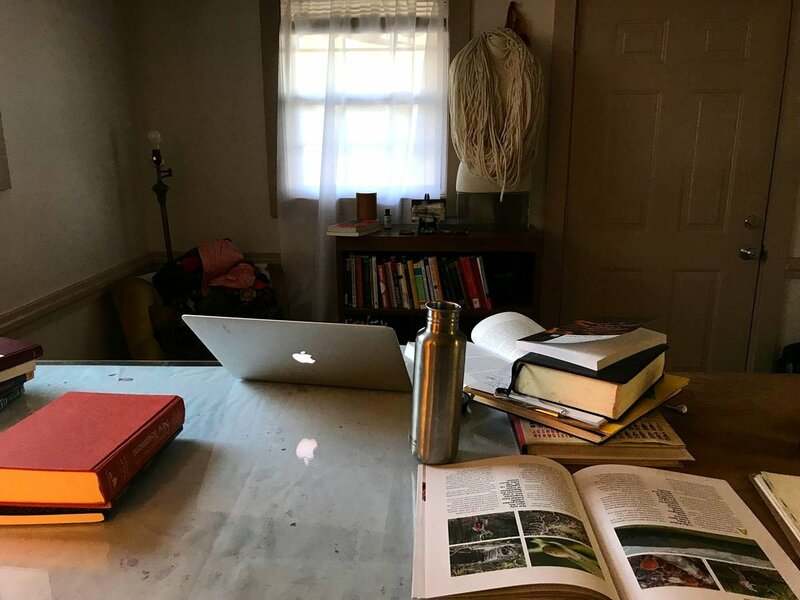 The studio space we previously occupied became unavailable and while we have a great setup for the summer, we are still looking for a classroom for the Fall. Let us know if you have any leads. 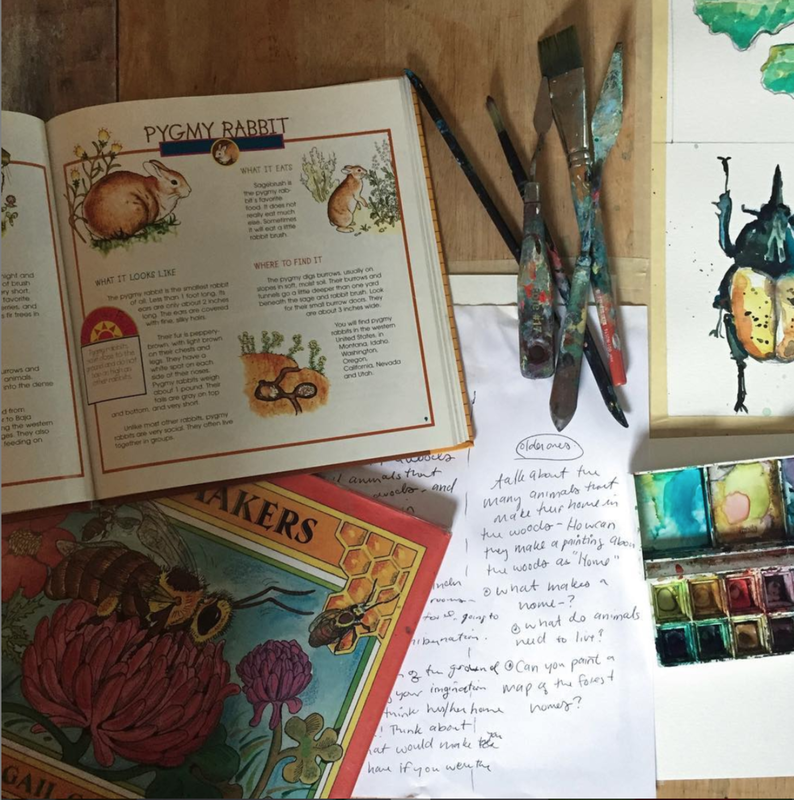 And now for studio updates from the TOSS teachers: Hannah, along with looking glamorous for Brandon Thrower's new marketing venture, White Blaze, has been cultivating her love for botanicals through some printmaking projects. 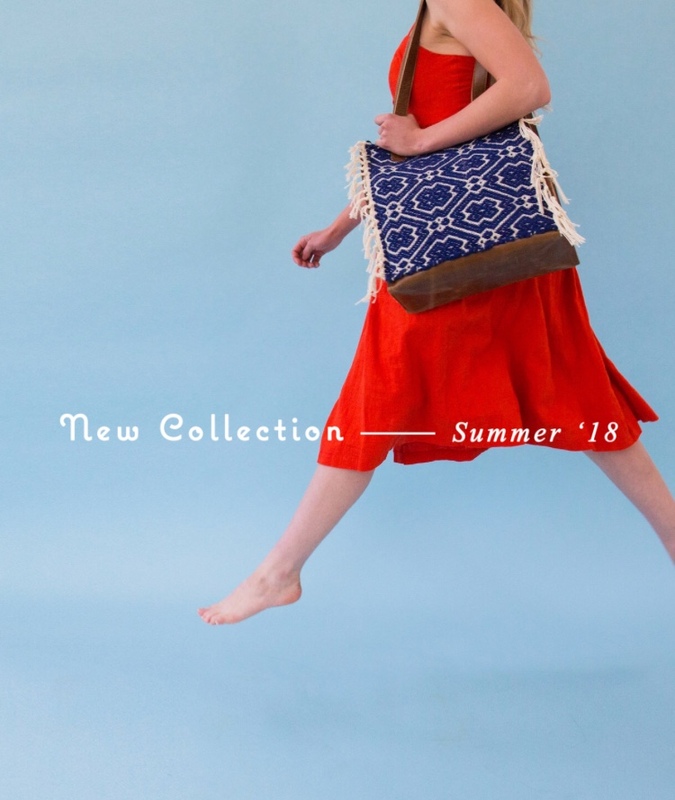 Kirksey's collaboration with Cageless Birds has come to fruition (YAYAY!) 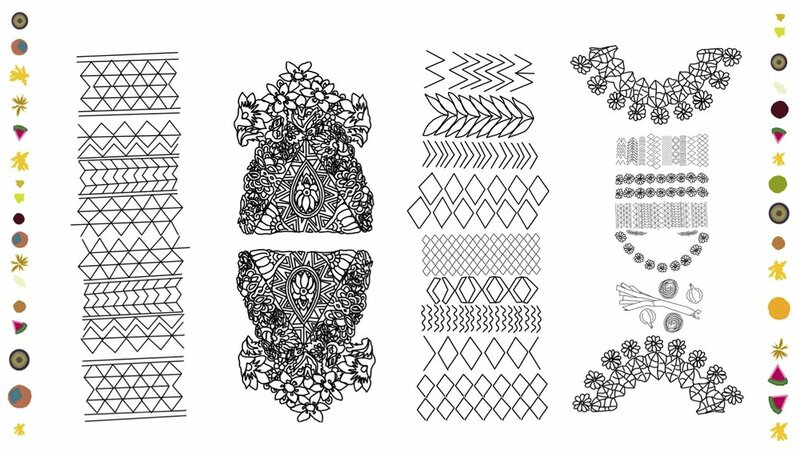 and Kathryn has made about 1 million graphic elements for a screen-printing project she is about to complete! What an insane month! 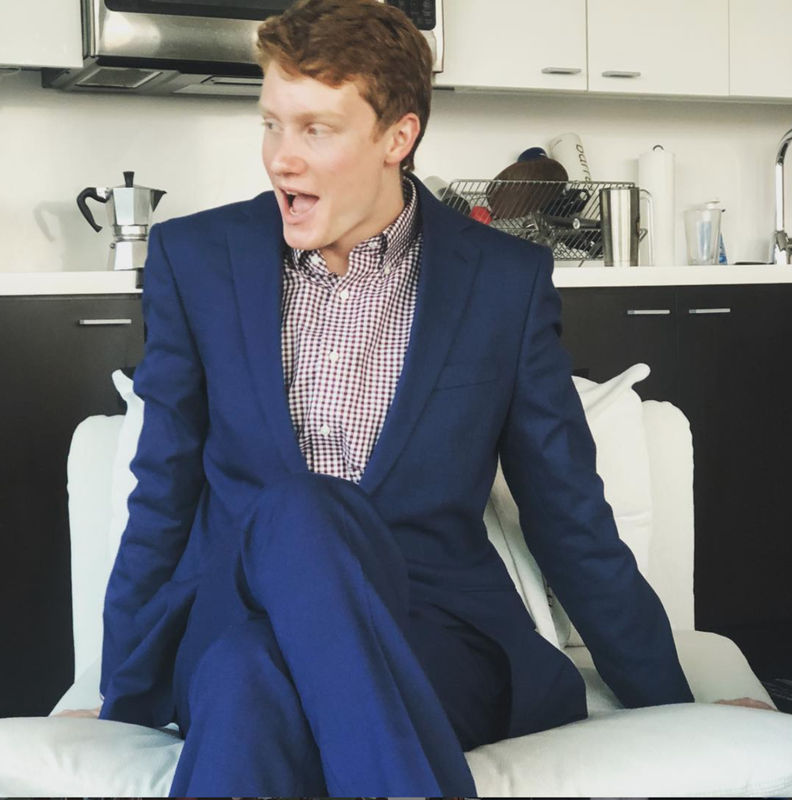 We want to say a warm welcome to Jordan Winiski, our summer intern extraordinaire! Jordan comes to us from Greenville, SC, where she is studying sustainability and art at Furman University. Along with volunteering at Art Bomb and Greenville Center for Creative Arts Jordan has demonstrated her passion and enthusiasm for the arts through her making practice. The recipient of the Winthrop University’s Dean Portfolio Scholarship (Fall 2016) and a participant in South Carolina's Congressional Art Show (2014, 2016), we are so excited to have Jordan's creative genius with us this summer! Check out her portfolio here and be sure to check in for updates on her projects. 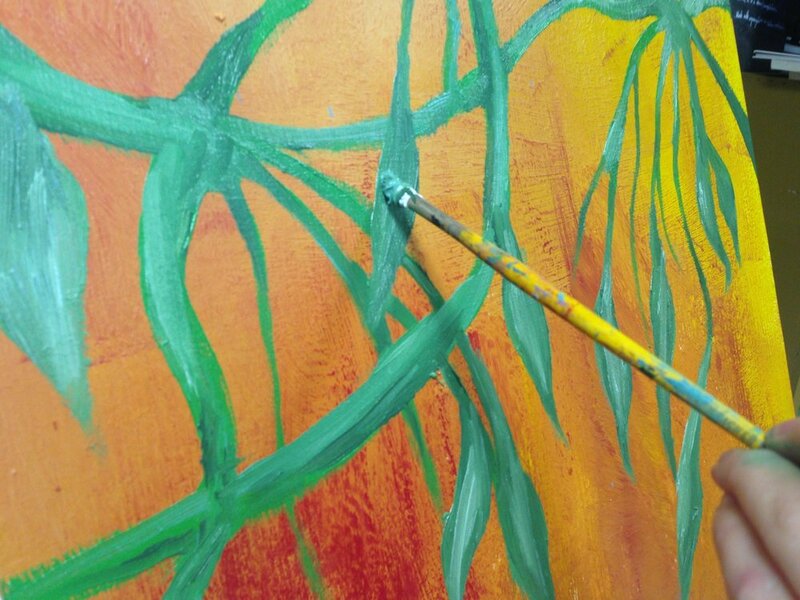 We have the privilege of collaborating with Lance Turner on a mural project this summer! We could not be more stoked! Lance is an incredible creative, with roots in Morganton, but currently based in Tennessee. Accepting his MFA in Painting from the Savannah College of Art and Design, he has exhibited all over the country, most recently in the Snap to Grid exhibition in Los Angeles. 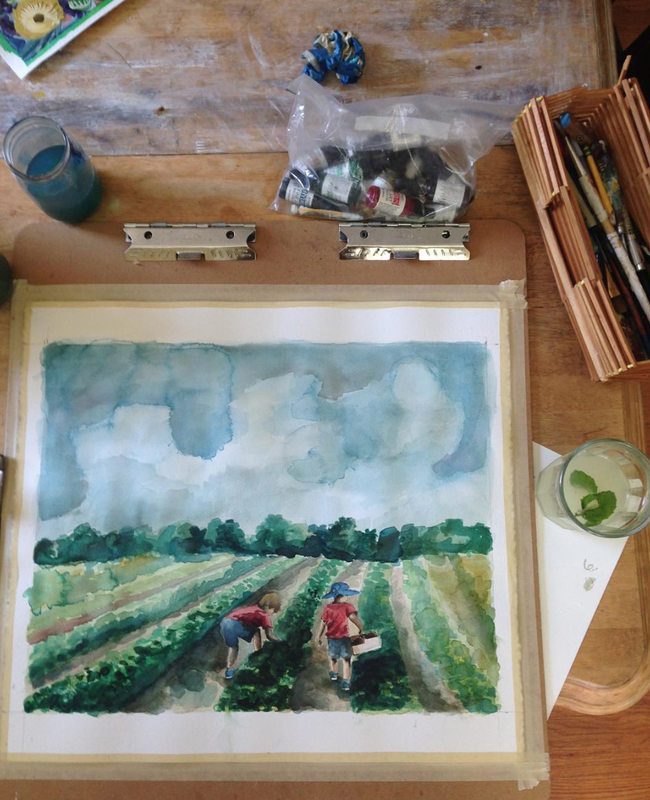 Awarded a fellowship at the Vermont Studio Center in Johnson, VT, he is community focused. We are so thankful he is excited about our mission and vision for Burke County. Check out his portfolio of work here. Below you can see some progress shots of a recent mural he designed and painted for Artfields, in Lake City, SC. And last but not least, thanks are due to all those who helped us move last weekend! We have successful moved our many Many items (with only a few casualties along the way). Our everlasting thanks to Michael Lowther, Luke Ervin, Christy Truitt and her gang, Brandon Thrower, Michael Griffin, the extremely strong Melinda, David Ervin and his sidekick Robbin, Elizabeth Williams, and of course Hannah Thrower, and Kirksey Lowther. We could NOT have done it without you guys!!! Marpril. That's right. March and April. Combined. 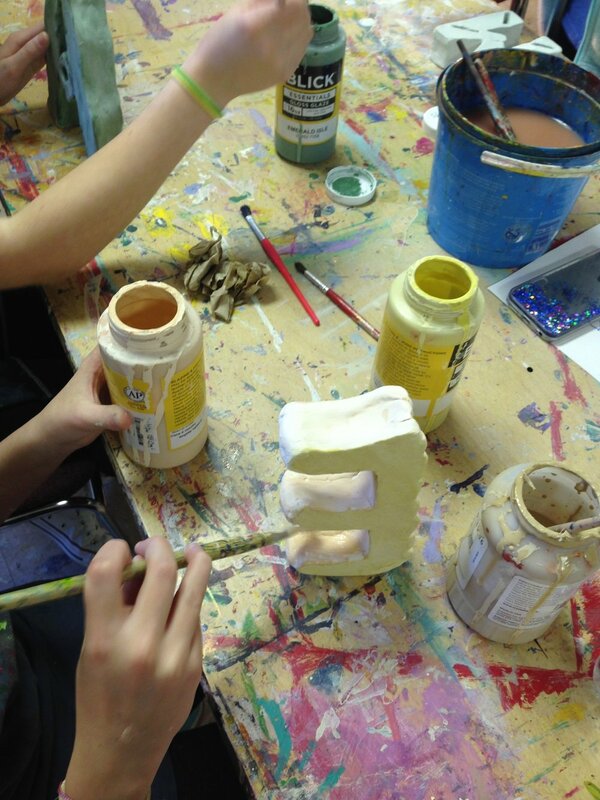 We are happy to bring you a few updates from our studio and snapshots of the creations happening on College Street, by both our students and our artists! But first a few announcements. This end-of-the-year event will be hosted by our friends at the Carolina HealthCare System on Thursday, May 17th. 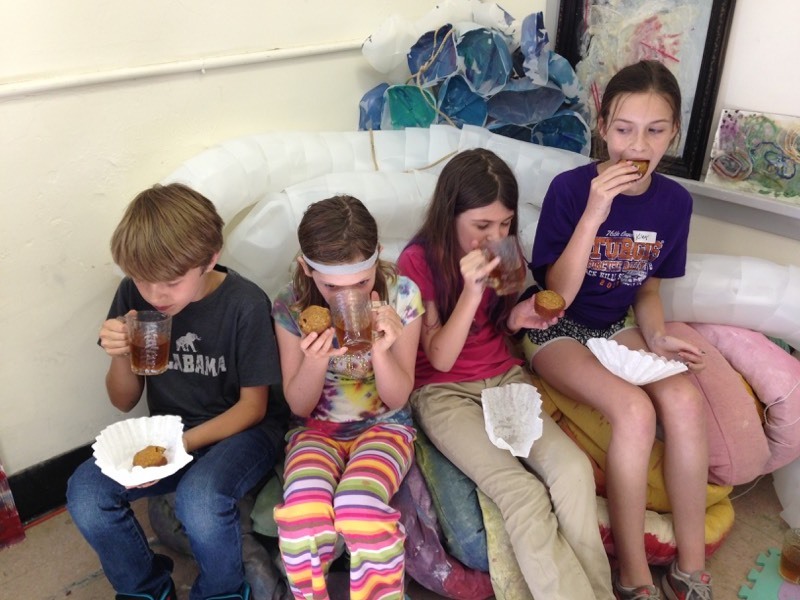 Student work, craft stations, really yummy food, and of course the most creative kids in Morganton. You won't want to miss it. We will have fliers at the studio if you care to take one home. Last month we were informed that the Burke County Public School System will be renovating the building we have been renting on College street for the future use of their central offices. While this transition has dramatically effected our ability to offer summer programing, we hope to find a suitable location to begin hosting classes in the Fall. k-1: In addition to our regular programing for k-1, we have recently had the honor of hosting a field trip for Morganton Day School in which we created an illustration in order to tell a story. We also got to host a birthday party for a very special little lady. As always, our Monday class is fearless and curious, ready to tackle any new challenge. 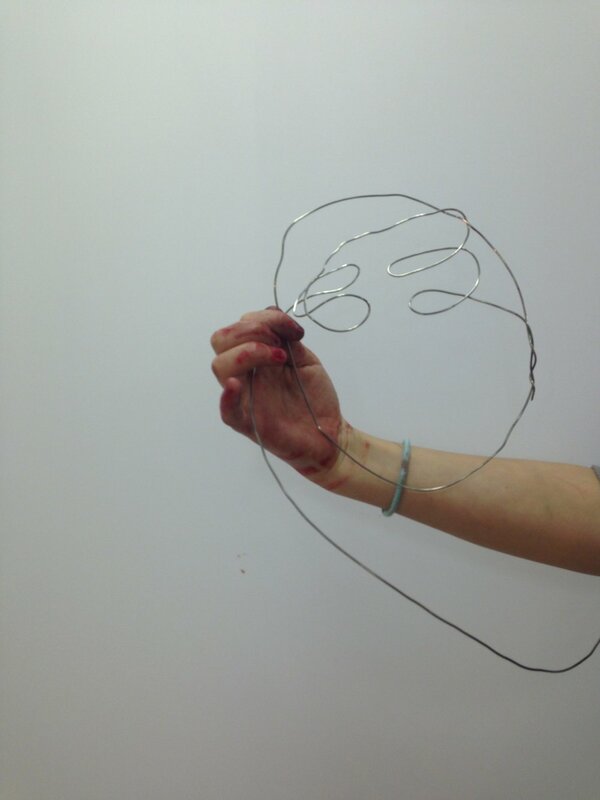 2-3: This Tuesday class has become increasingly experimental in it quest to understand the different mediums of art. We try encaustics, paper-making, making paper cups with plaster molds, painting with stencils, painting with pipe cleaners, painting with paint, making shapes with wire, making extremely scary sculptures with paper-clay that never quite dries correctly... Once we tried screenprinting and recently we glazed our ceramic mugs. And thankfully that is all. For now. 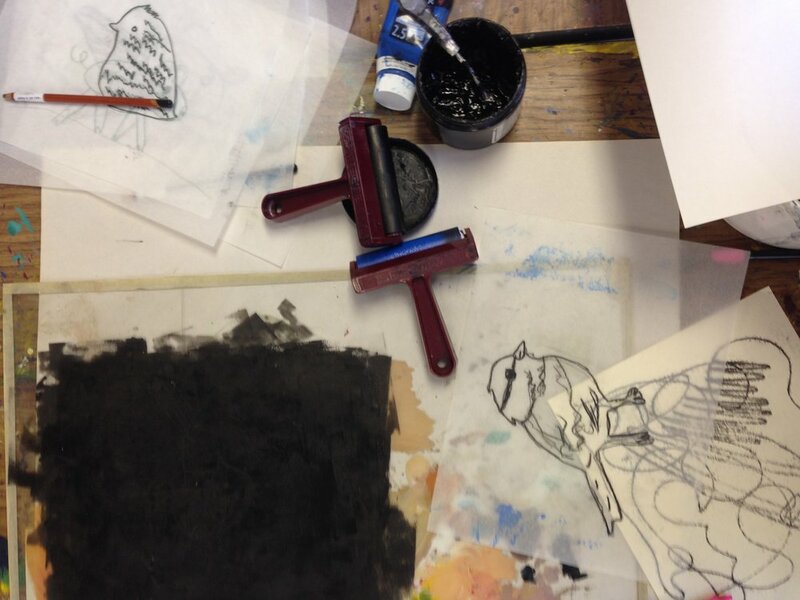 4-5: This group has made a number of fabulous contour-line portraits using the process of monoprinting. Along with ceramic slab-building, painting, and general shinanigans, this class is having tons of fun. Possibly too much fun if we are all honest. 6-8: Highlights include the successful completion of our slab-build ceramic letters, experimental techniques in clay, and forays into the design of our own projects for the Spring show. 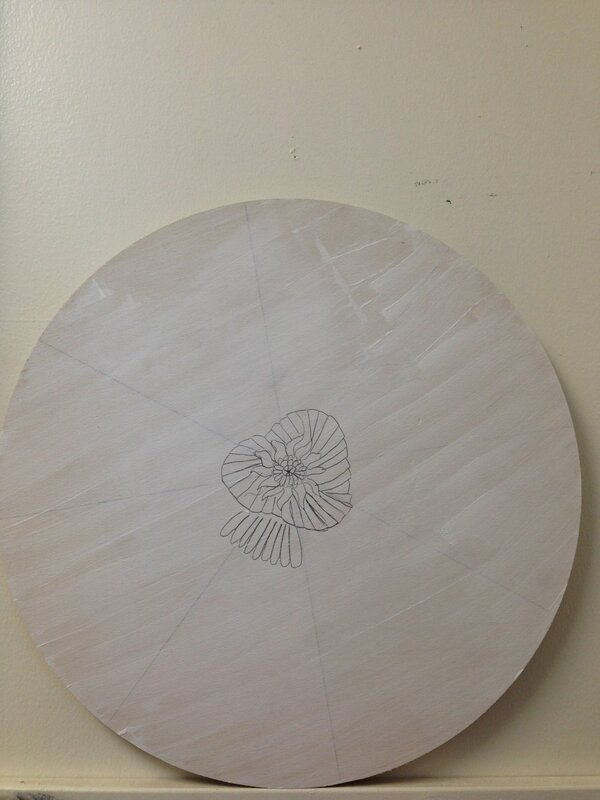 9-12: The intrepid progression of the high school students in their personal projects has been inspiring! As concerted efforts are applied to understand materials and methods, drawing and painting alone have given us plenty to think about. 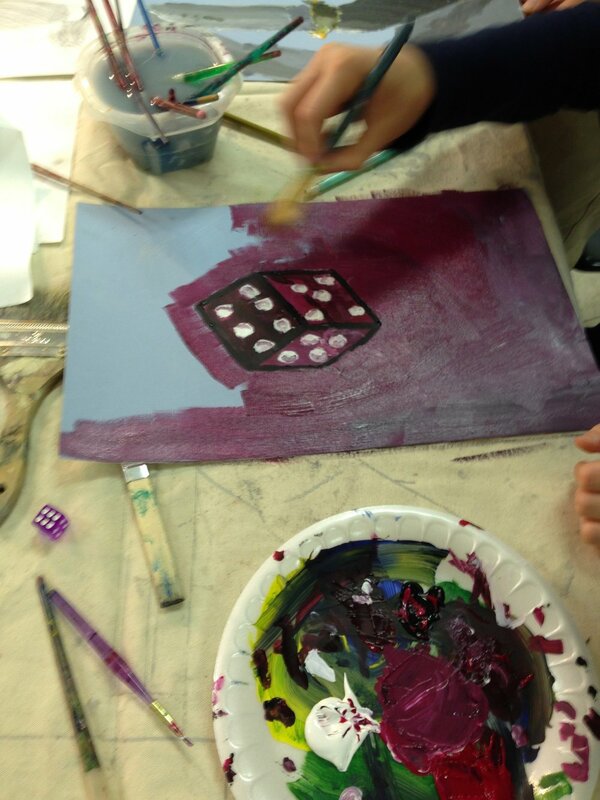 Here is a little peek into our month of art making at TOSS! Kindergarten-First grade: We have recently stepped into the world of texture through the mediums of sewing, ceramics, and encaustics. Second-Third: With elements and principles of design on our mind, we create miniature worlds in the style of dioramas to express the many types of lines we see around us. 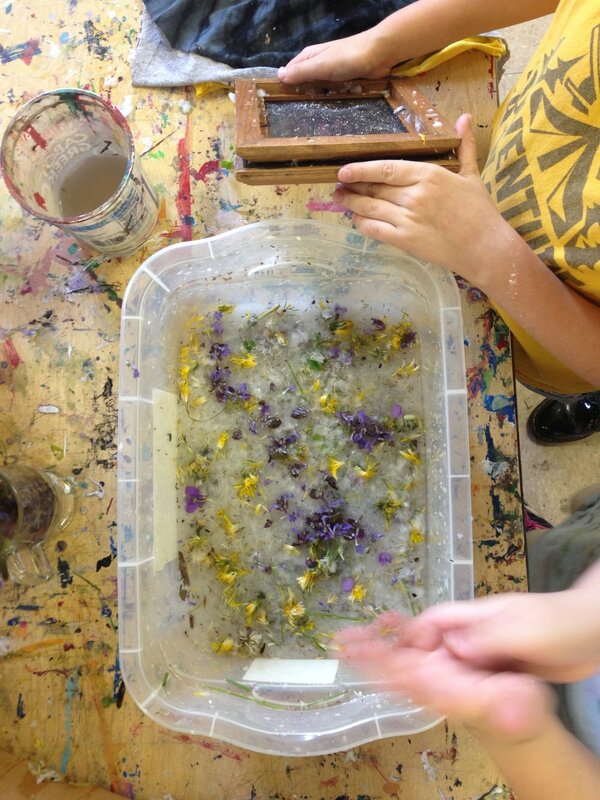 This class has also been dabbling a little in encaustic art- who can resist! Fourth - Fifth: Art is a risky business. 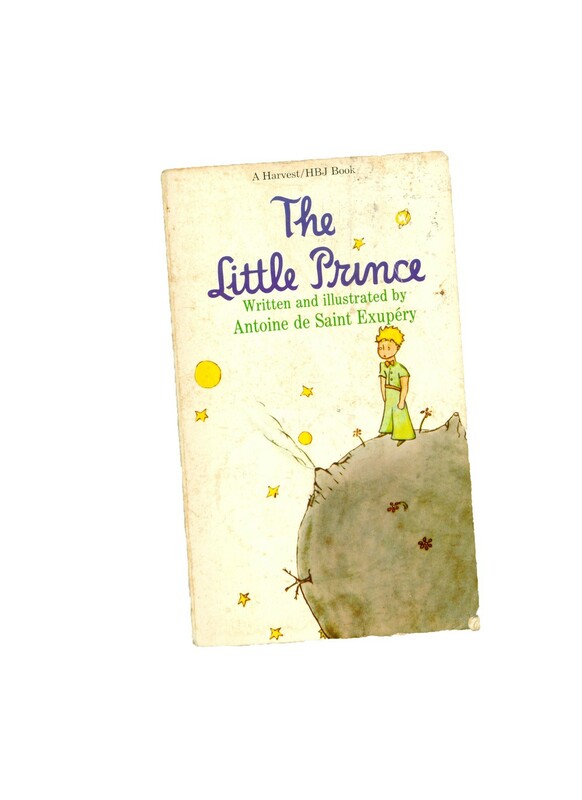 It's important to learn how to take a step into the unknown. Doing that in a safe environment, such as the art classroom is incredibly beneficial for a student. Simple things like adding color, layers, pushing a piece of art just a little further when you think you are finished.... it's all a part of creating, problem solving, and risk taking. We've got nothing but love for Morganton on this year's Valentines Day! 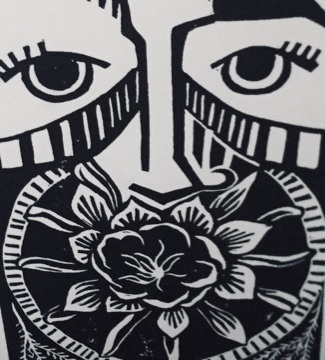 Watch this sweet video made with a printmaking technique learned by the 4-5th graders. 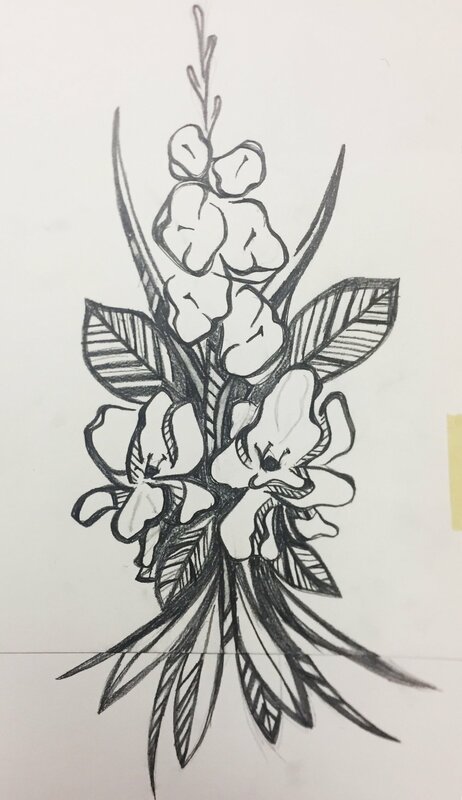 Sixth-Eighth: What is more rewarding (or intimidating) than learning to draw! 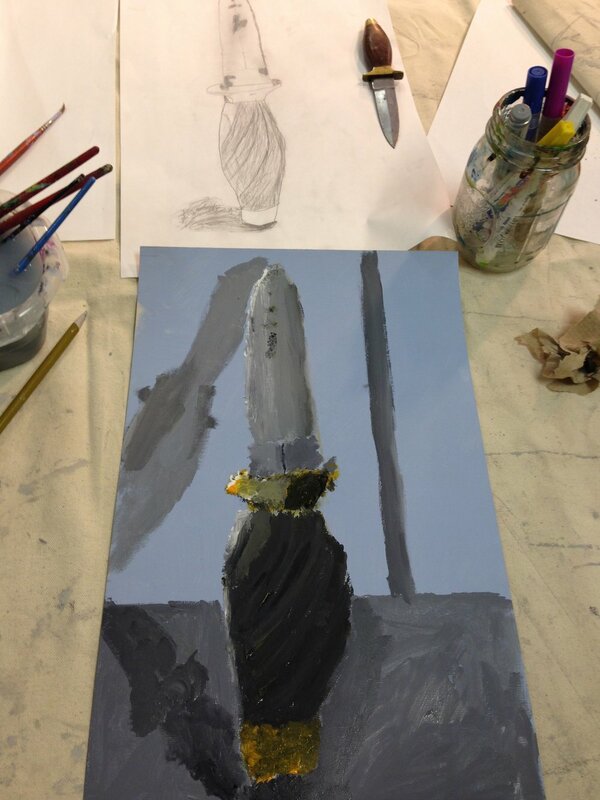 As we have finished up our ceramic project, this month we have been tackling the art of the still-life! Our middle school group has been so focused and we are really proud of them! Speaking of how proud we are...Woohoo!!! McKenna Carver won a Silver Key through the Scholastic Art and Writing Awards this year! Her painting, Tossing, also won the Governor's Student Excellence Award. We were so proud to be there with her family and Kara Jones, her art teacher from Morganton Day School, to recognize her achievement! Way to go McKenna! Ninth-twelfth: With focused projects ranging from mixed media, drawing, and oil painting, this group is zeroing in on the unique area of interest. 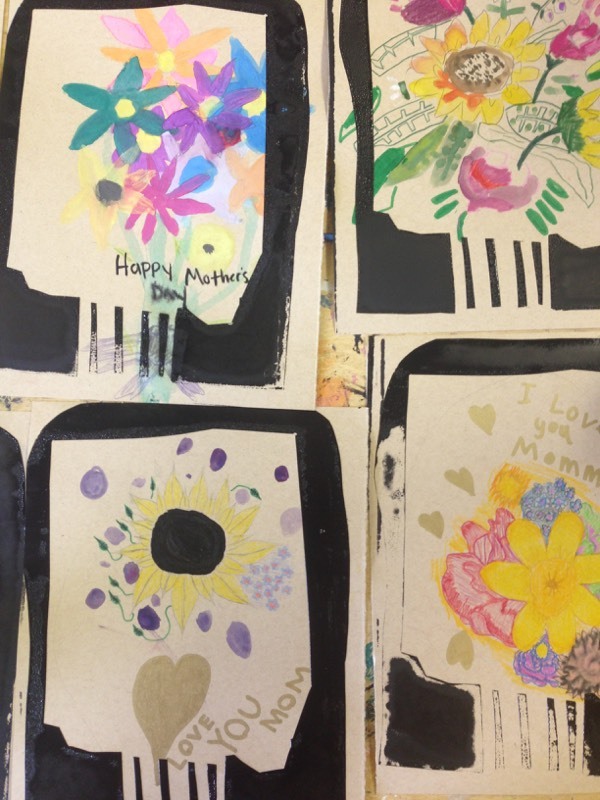 TOSSAiR: In preparation for our Spring TOSSing, the TOSSAiR's have been busy in their studios painting, weaving, and working with ceramics. Here are some progress shots! There are incredible organizations working in the College Street building! One (right down the hall from us) is the Western North Carolina Workers' Center. They develop leadership among workers in our area through organizing and education to resolve issues of labor rights and promote fair working conditions in Western North Carolina. 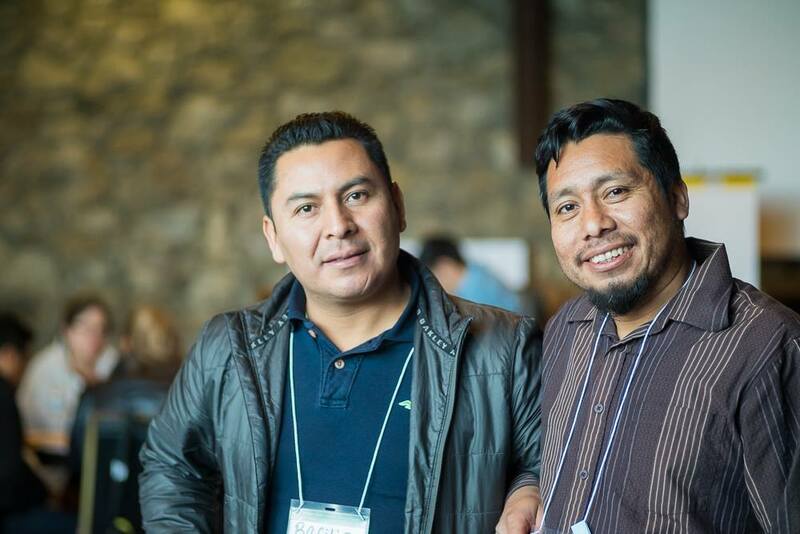 The two organizers we see on a daily basis are Juan and Bacilio. A big part of their programing is around issues of workplace health and safety, wage theft, and woman fighting injustice. One of their most recent victories was in organizing the testimonials of poultry workers in this area and garnering the support of 100,000 allies prompting the US Department of Agriculture to rejected the poultry industry's petition to increase line speed in their factories. This will have a direct effect on workers in our area. Check out the narrative developed by Oxfam America called Lives on the Line. It illustrates the issues taking place in our very own neighborhoods. We are so so grateful for the love and support we receive from each of you. If you woud like to here about ways to get involved or volunteer with our students, we would love to make that happen. A special thanks as always to the BAC for their support, and for the new table for highschool room. We are spreading out! To our friends over at the Resource Warehouse for their donations of materials: Thank you. We. Love. Art. Supplies. Also, thanks are always due to the Burke County Public School System for their ongoing logistical/spacial support. We so enjoy our space on College Street and are so thankful to Bob Accord for always being a willing aid. But guys, sorry: Melinda Davis and Samuel Kuehnert are still our favorites. Thank you both for lending a hand and being such a fun part of Thursday!! Thank you all so much for helping to support our little school of artists! We are so thankful to you! We are back at it folks. Along with facilitating our weekly TOSSafter studio sessions, the TOSSAiRs (Artist's in Residency) are hard at work generating creativity in their studios. Here is a little more info on these ladies. Kirksey co-founded TOSS in 2015. She graduated from Appalachian State University with a Arts Education degree. Her current AiR focus is on weaving and painting. She is also a full time mom (incase you didn't know she is a busy lady). Which would you rather: eat a crayon or lick a dirty TOSS paintbrush? I'd lick a paintbrush. Where is the most extreme or unusual place you have created art? On the back porch of a family's house in Thialand amidst much laundry. If you had to eat only one meal for a year what would it be? Chicken pot pie. Hannah joined TOSS in 2016 as a studio director and AiR. 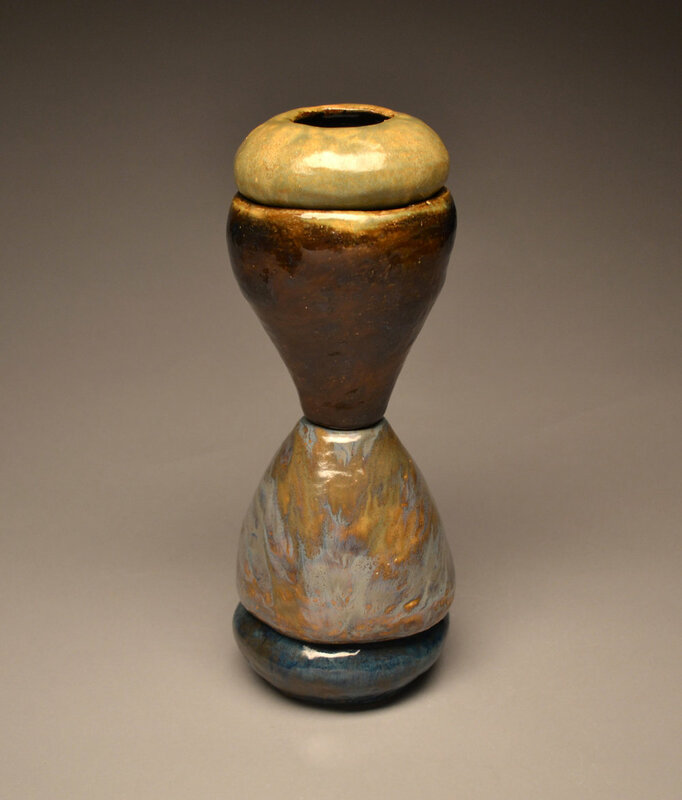 She graduated from Appalachian State University with a Arts Education degree; her current focus is on ceramics and printmaking. Which would you rather: eat a crayon or lick a dirty TOSS paintbrush? I'd eat a crayon. Where is the most extreme or unusual place you have created art? Grace Village, Ethiopia. I taught art for a week to children in an orphanage as well as partnering with them to painting a sign for their village. If you had to eat only one meal for a year what would it be? Steak, potatoes, and broccoli...well seasoned. Follow Kirksey on instagram, here. Stills from an animation in collaboration with Courtney Marie Andrews for her song, Woman of Many Colors. View the video here. Kathryn co-founded TOSS in 2015. She graduated from East Carolina University with a Studio Arts degree; her current focus is on site specific art and storytelling. Which would you rather: eat a crayon or lick a dirty TOSS paintbrush? What! Neither. Who made up these questions?! What master artist are you most inspired by? The cave painters of Lascaux. Where is the most extreme or unusual place you have created art? One time I made a glass house in an abandoned lot in a tiny Southern town called Lake City. If you had to eat only one meal for a year what would it be? Oatmeal. Just oatmeal. You can follow her on instagram here or view her website here. Nysie Hurst rolls up her sleeves as she gets down to business in her new studio on College Street! Nysie is a mixed media artist who often works with TOSS on various projects (most recently bookbinding with our middle school students). She will be using her new studio to perfect her paper making techniques, work on paintings, and develop community art collaborations with TOSS and beyond! We are so glad to have her as a neighbor! A special thanks as always to the BAC for their support. We are also SO excited for the awesome paper making frames that John Ferguson has made and donated to our middle school class. WHAT! THANK YOU JOHN! Melinda Davis and Samuel Kuehnert. We love you. Thank you guys for making Thursday the best day of the week. November has been a month of exploration. As our students hone their skills we collectively develop a language of design. Harnessing the creative process through exploration allows us to make discoveries (and mistakes) awaking our everyday potential. Check out a few examples of how our students do just that. How does one transform a mental image into a two-dimensional form... then bring it into three dimensional space? Our first graders can tell you a bit about that in the making of sculptures which emphesize line and shape. 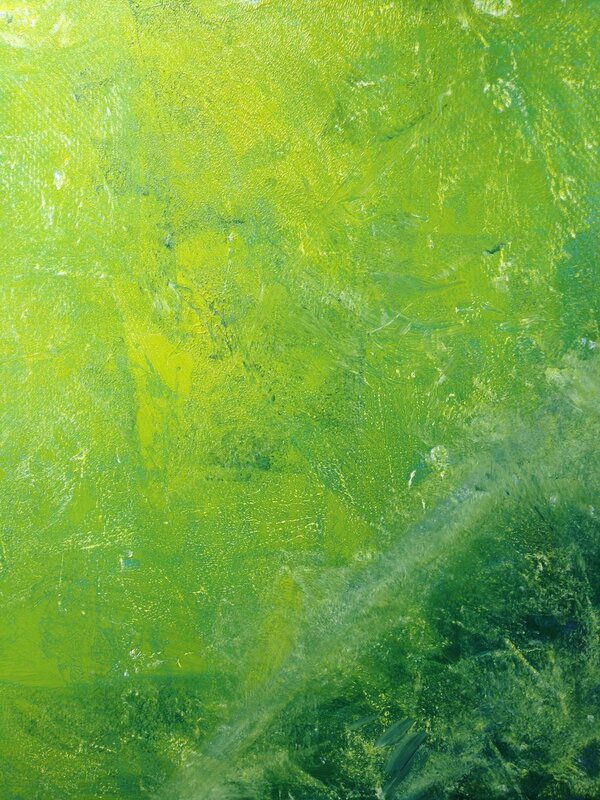 There is nothing as agonizing as a multi-step project...or wonderful: Layers of paint are like layers of thought. We are impressed with our students for executing projects which require extended attention with layer after layer, design and redesign. Abstract art is sometimes equated with haphazard. The synthesis of orchestrated abstraction is what you will find 4th and 5th graders learning as they carefully plot their weavings. Middle schoolers take techniques, such as drawing with one or two point perspective, to TASK. Here, everyone raises an eyebrow when Hannah says, "Now, use this principle to draw a wild animal and its house." Sometimes we don't know the destination until we have arrived. This is often the case when we explore new mediums or set about breaking a preconceived idea. Whether we are making art about dreams employing color theory, creating a volcanic mirage of color with glue, or starting our career as illustrators (just saying, Jaylen), we are excited to be on the journey. At TOSS, one of our goals is to give artists opportunities to make alongside students in the form of an Artist in Residency program (AiR). We see the beauty of this model as we work alongside the students, develop our own making practices and share our experiences with the broader community through community collaborations or TOSSafterhours classes. 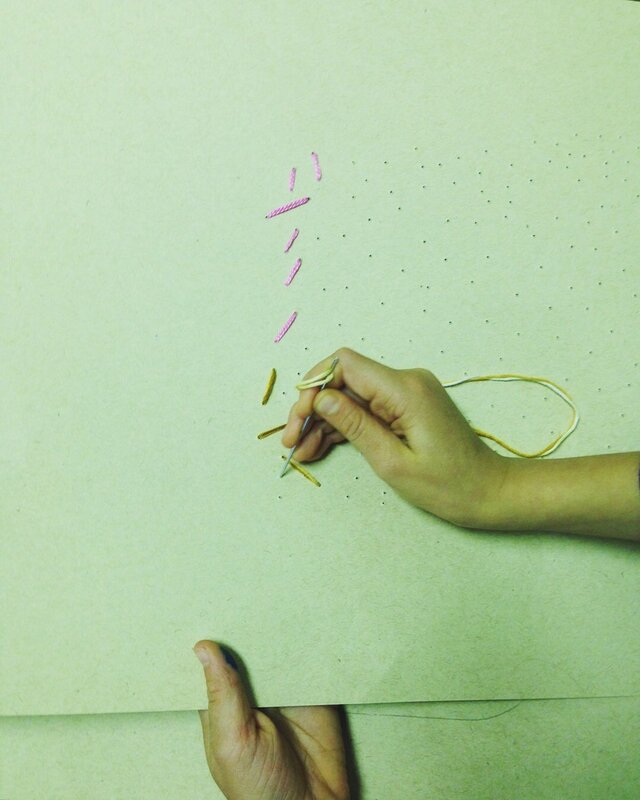 This month we have been doing just that: Hannah shared a new medium she has been exploring, hosting a macrame class. 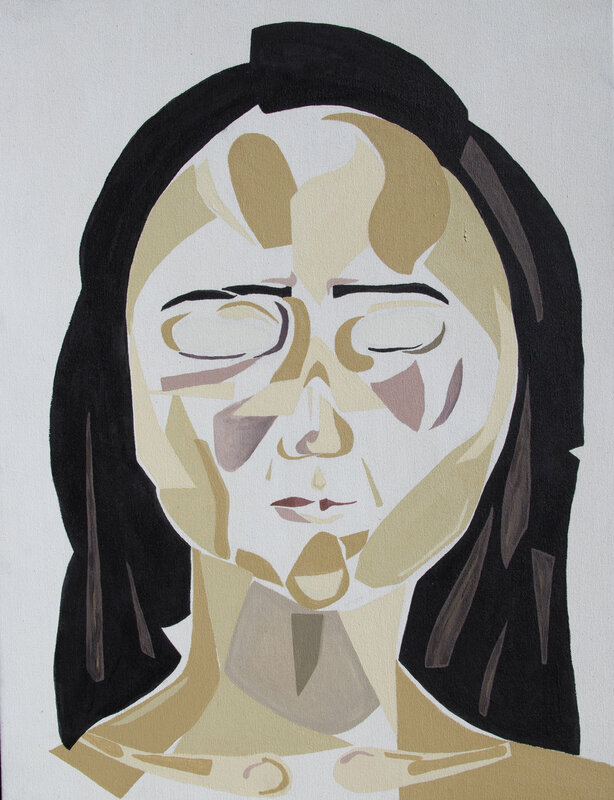 Kathryn began investigating a few avenues of figurative interpretation. ahm... and doing other stuff. A special thanks to the Burke Arts Council for their support. We are also so so thankful to Melinda Davis and Samuel Kuehnert for their help in the studio. We love seeing them every week! Burke County Literacy Council is a non-profit organization committed to helping adults in our community learn to read and/or improve their literacy skills. In addition to adult reading classes, the Council has classes to train parents in how to better help their children in school. In addition, the Council offers English classes for those wanting to learn the language. They also train volunteers to tutor adults who need help with reading. All training, classes and materials are free, and you are invited to join the classes at any time. 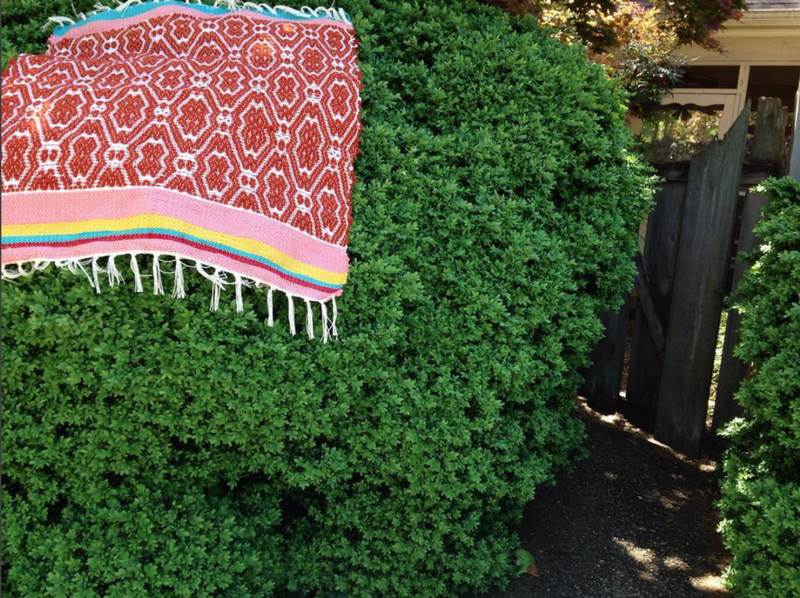 This fall TOSS has been hosting weaving workshops for those participating in Project FLOWER. This is a program that we will continue into the Spring. We are so thrilled to be partnership with the BLC! We love our College Street studio and part of that is having great neighbors doing incredible work in Burke County. For the next few months we are going to highlight a partner that we have had the privileged to work with, starting with our neighbors in the Old Junior High School. One on One Adult is private and confidential tutoring. Reach Out and Read is a partnership with Mountain View Pediatrics to provide free books to children at each well check visit from ages 0-5. Motheread/Fatheread teaches parents how to help their children learn. Project FLOWER is for adults who do not speak English. Project Citizenship is for immigrants who need help to prepare for the INS (citizenship) test. Thank you for all your love and support! We couldn't do it without you. Come see us in a few weeks at the Snowball TOSSing! With each day feeling more blustery than the last, TOSSafter students have been hunkering down. We are stretching our minds, considering new approaches to art-making. We are learning new skills in order to bring our imagination to life. 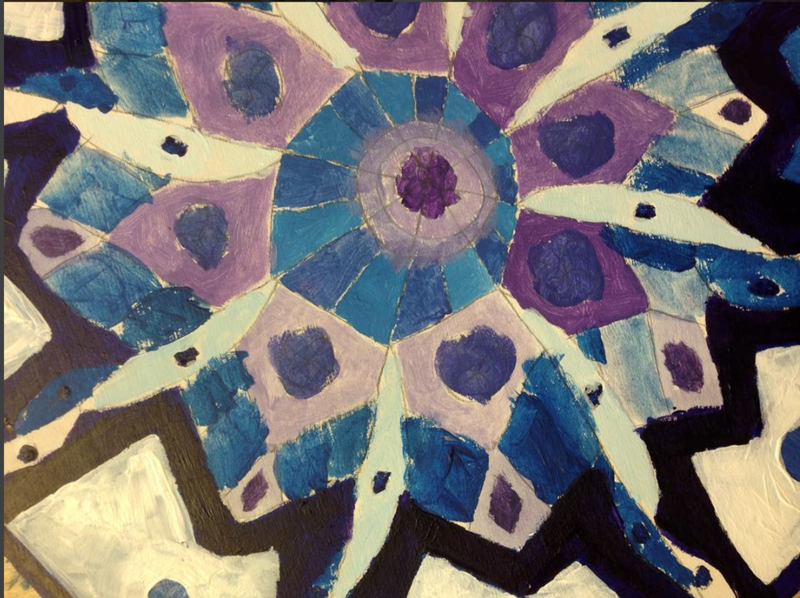 Check out what the TOSSafter students have been learning and the teachers, too! Hannah, Kirksey, and Kathryn are staying busy: We have enjoyed our collaboration with Project FLOWER sponsored by the Burke Literacy Council, supporting the Burke Arts Council at the October Oyster Outing, working on weaving commissions, designing TOSSafterhours classes, and participating in conversations about the integration of education and art with others at AiR Serenbe in Atlanta. To hear about more about any of our projects or collaborations, drop us a line! A special thanks as always to the BAC for their support, and to our generous sponsors who are helping to build our scholarship fund: Grace Episcopal Church, Sherry Lindquist, Sevan and Keri Topjian. Thanks are also due to Elizabeth Gould, Elizabeth Williams, and Lucille Hartman for their generous donations this month. We are so grateful for more yarn, paint, and drawing materials! Would we really be able to get anything done without Melinda Davis and Samuel Kuehnert helping on Thursday? Unlikely. Thank you guys for lending a hand and being such a fun part of that day. Thank you all so much for helping to support our little school of artists! We are so thankful to you! Happy Fall ya'll. Greetings from our College Street studio! A new term as begun for our TOSSafter students! There is still room in our k-1 and 2-3 grade classes. Register here, today! Interested in sponsoring a student to attend our studio? Find out more here. September has kicked our year of art-making into high gear. This fall, we are focusing on two themes: Engineering our imagination and personalizing our creative expression. Stay tuned to hear more about how we are accomplishing this. In the meantime, enjoy a few progress shots of our studio hour below! KIrksey Lowther has been the most creative team member thus far this year, giving birth to her second son, Peter Merrifield Lowther! Congratulations Lowther family! This has hardly kept her from making other art creations, you can follow her on instagram @kirksey.lowther. We miss her in the studio, but are so excited about this new member of the family! Hannah Thrower, amid leading our 4-12 grade classes, has started her school year teaching art at New Dimensions, participated in downtown Morganton's Tour d' Art, hosted a printing class at OSuzannah's, AND just bought a house with her husband, Brandon. She is awesome! Kathryn Ervin, back from her residency in Maryland, is jumping back in as TOSS' k-3 teacher. She started her graduate studies through Fuller Seminary this fall and is working with a non-profit consultant, Grady Powell, in Greenville, SC, on a community engagement project. She has been really enjoying a collaboration with the Burke Literacy Council leading a weaving workshop for the participants of Project Flower. As always, thanks is due to the Burke Arts Council for their love and support! We would like to say a special thanks to Burke Primary Care, Don and Susan Haugen, and Dotty Ervin for sponsoring TOSSafter students this term. Thank you so much for making creative opportunities available for everyone! Thanks is also due to Teresa Reep, and Dan and Cindy Kuehnert for their generous donations this month. We love our new shelves! A shout out to our fierce volunteers, Melinda Davis and Samuel Kuehnert. Thank you guys for all your help! Many thanks and much love! Enjoy the videos made by our talented campers!! 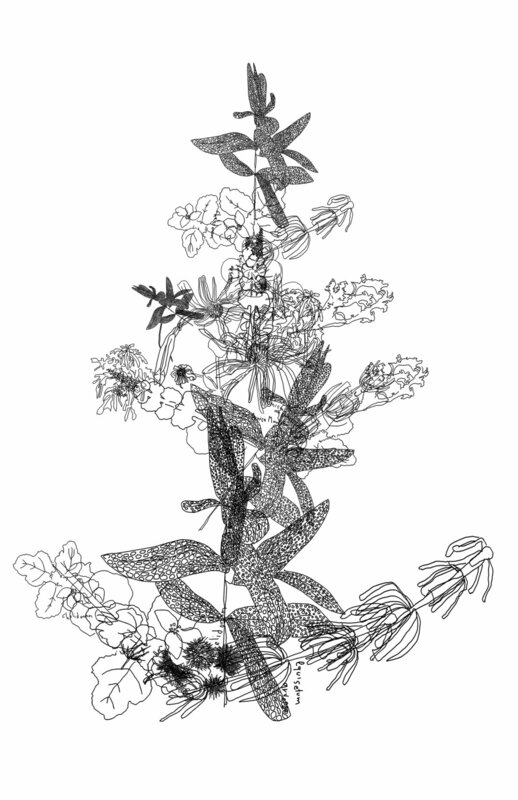 First here are a couple digital drawings... While groups were working hard on their animations there were a few kids that got the opportunity to draw on the computer. Super fun! Digital painting by Jayden, age 6. The last week of Summer Camp was a blast, but also a challenge with 16 kids in our classroom. We buckled down and made some very fun collaborative stop-motion animations. The kids were challenged to work within a team, and do some major problem solving. They were inventive, and creative. Each group came up with a different story, and made their own set, and built their own characters. Please enjoy! The first project we filmed was a found object stop motion. The kids worked together to shoot these short films. Next up are the Stop Motion Animation Movies! Enjoy all of our students' hard work! This movie was made by the older group of campers. They were able to write, direct, shoot, and edit their movie independantly. This movie was also created by an older group of students, we were impressed by their camera skills! These next two films were written and shot by our campers ages ranging from 6-8. They did an incredible job building characters and painting their sets. We also had a chance this week to work on some photography skills. Brandon Thrower came in an taught our campers some photography basics and practical photo editing with the little device so many of us have these days... the phone camera. Here are some of the photos taken by the campers! We weren't able to take a trip to Disney to experience Animal Kingdom so we brought Animal Kingdom to TOSS summer camp! 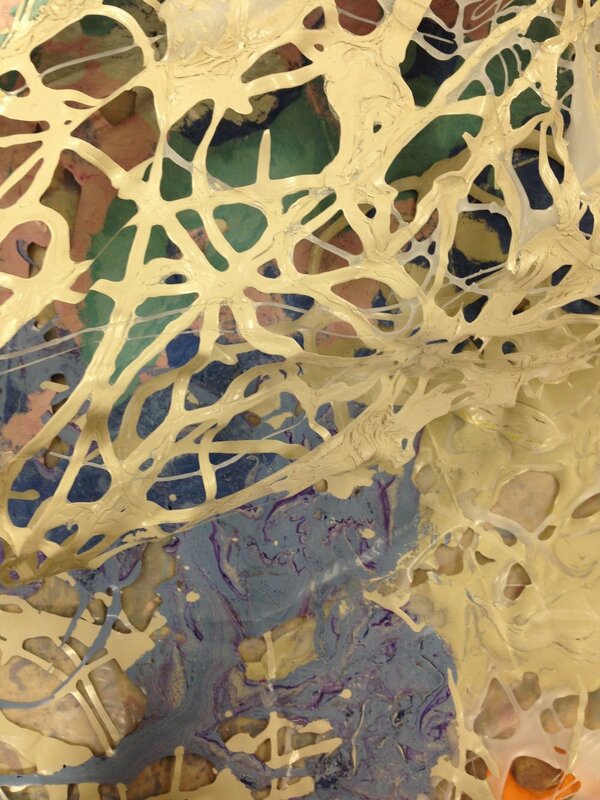 Painting, drawing, printing, and sculpting was the name of the game this week. Animals have been a wonderful source of inspiration since the earliest cave paintings, so we couldn't ignore their artistic power. 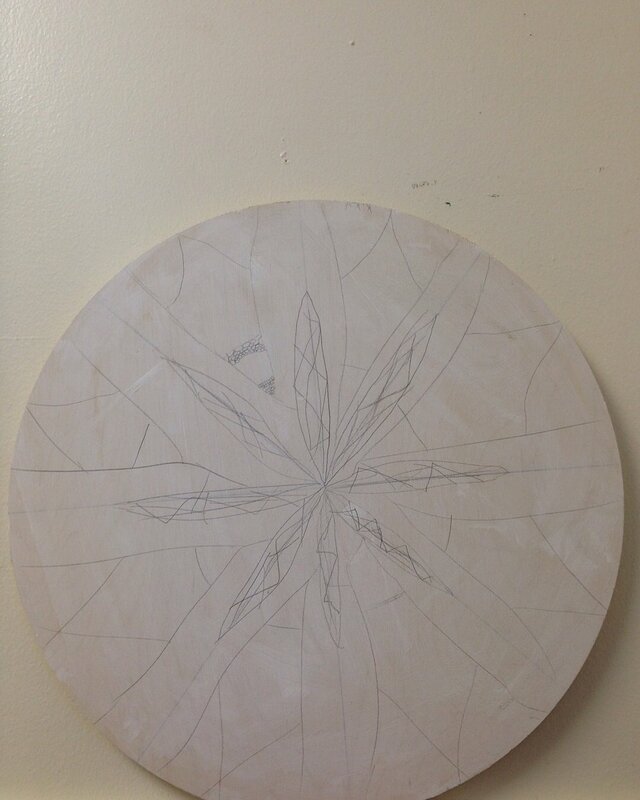 This week students explored all different areas of fibers. Students were able to sew pillows, collage fabric, make paper, weave, and felt. A special thanks goes out to Aleisha Mathews, owner of Manazhe Fashions in Downtown Morganton, for opening up her studio to our eager artists.